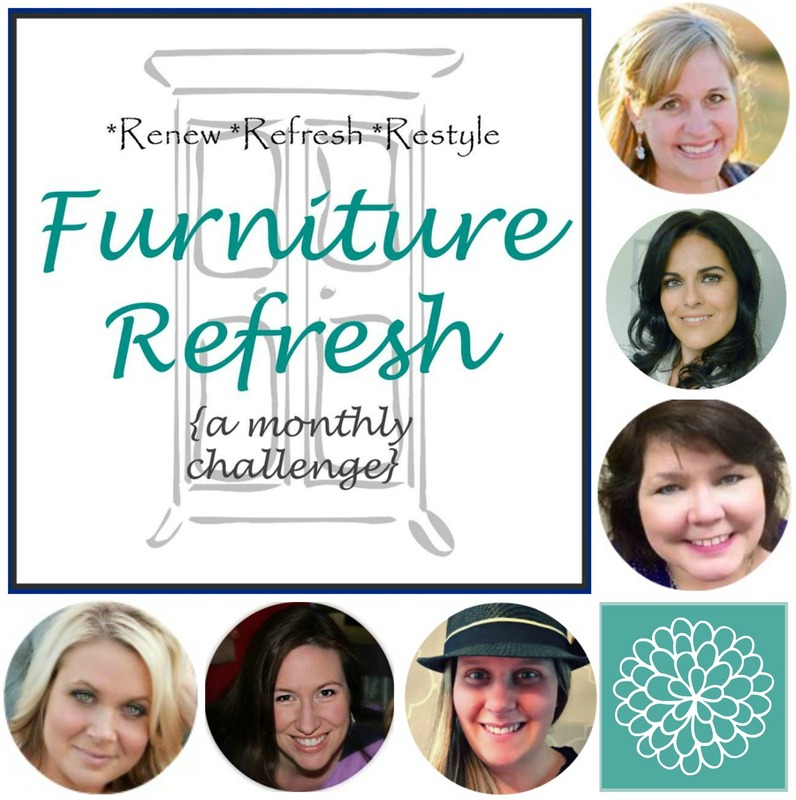 This month, I’ve teamed up with 5 amazingly talented bloggers to bring you the Renew * Refresh * Restyle Furniture Challenge. 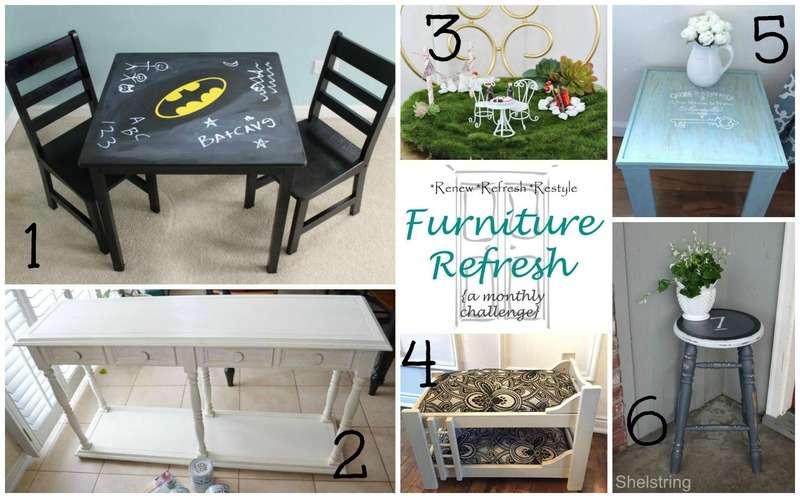 In this new monthly feature, we’ll each complete a project where we refresh a piece of furniture (big or small) into something new and fun. 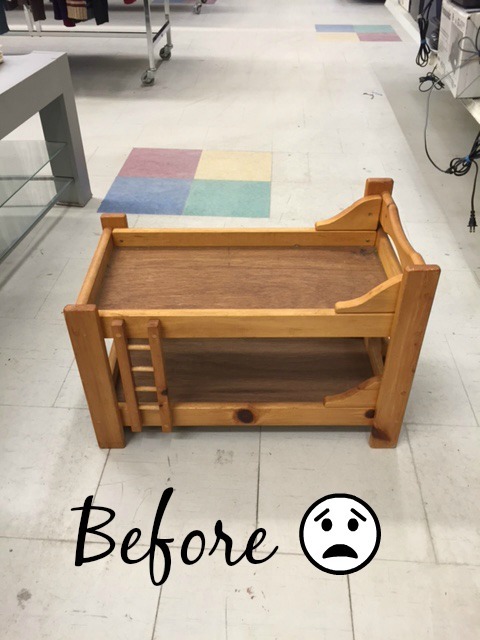 Be sure to check out all the projects from my blogging friends as well 🙂 For my project, I completed a fun little DIY Pet Bed, and I’m so excited to show you. Here is what I saw at the thrift store. Shortly after walking by it, the light bulb inside my head went on. Ding! This project was fairly quick and easy. 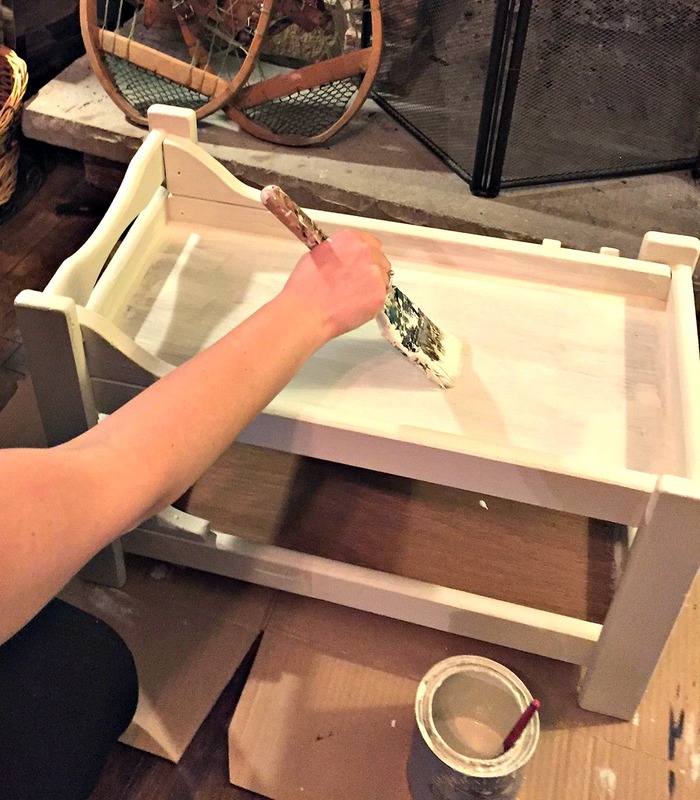 I used white chalk paint to transform the piece with 3 even coats. Once the paint had fully dried, I applied a soft touch varnish (like a polyurethane) to protect the finish on the bed. The next step was simply adding the padding. I had two matching rectangle cushions lying around that I was no longer using, and figured it would be the perfect opportunity to re-use them. 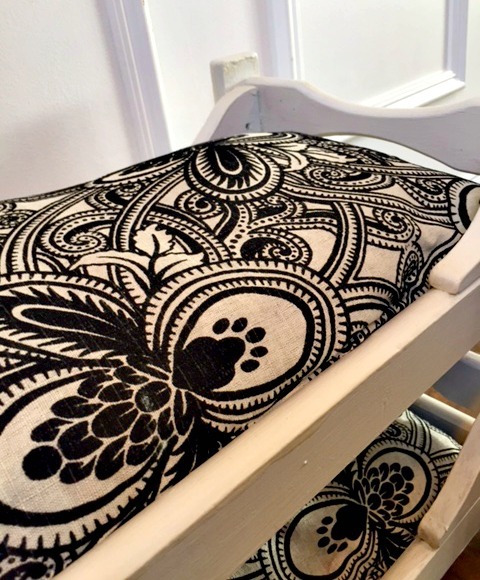 I love the pattern on the cushions, and how it makes the pet bed look sophisticated and chic. 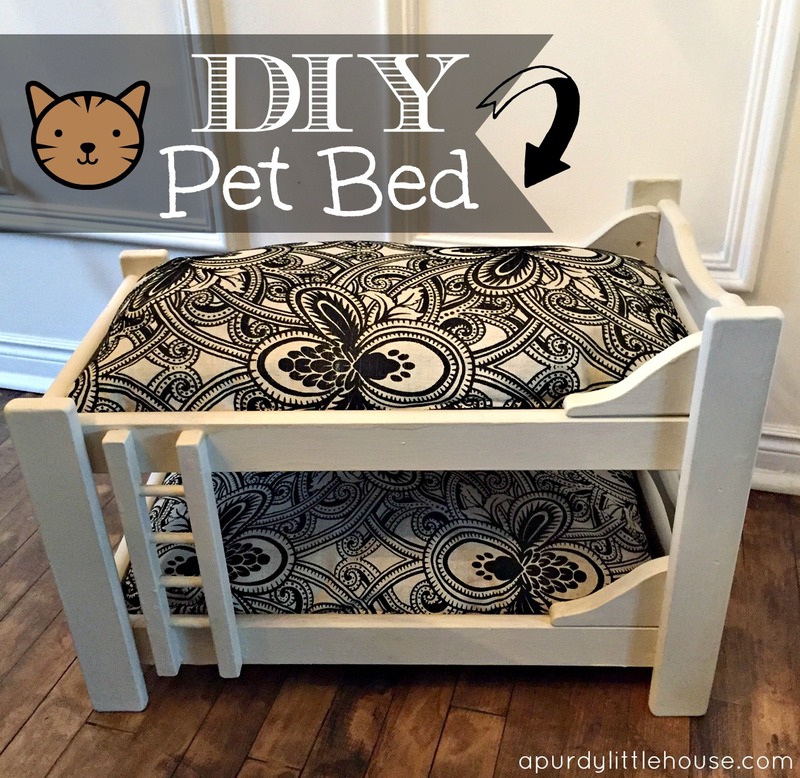 Let’s face it… Typical pet beds can be kind of ugly, and that’s partly why I love this alternative option for a fun lounging spot for a cat or a small dog. I also love how versatile this bed can be. The fabric on the cushions can be changed out anytime and can suit any decor. I just love how it turned out and can totally picture a little Maltese or a sassy cat hanging out on the top bunk. Lol. 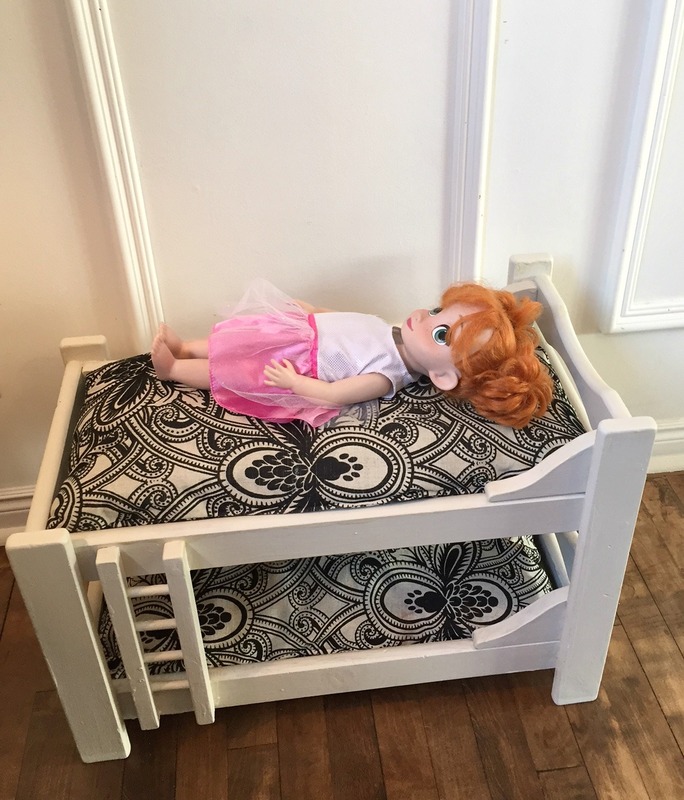 Move over Mittens…… The bunk bed can also be used for dolls! Here is my daughter’s Anna doll chilling out on the top bunk. I’m pretty sure our cat Ginger would love curling up on the top bunk! I think this would work for my cat Tinkerbell! Reba our rescue pup, would never fit. I just don’t know if it gets any cuter than that! I love the high end look for the budget friendly price. Nice job! 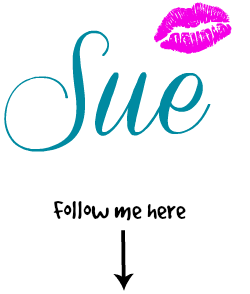 Sue-you did such an amazing job on this! 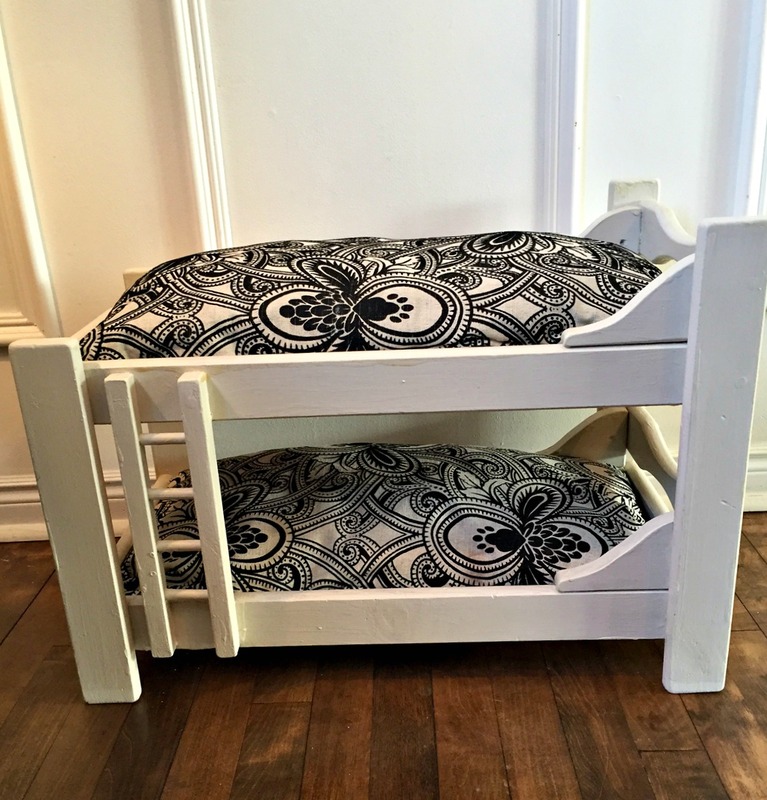 I love that you saw a dog bed out of this-so cool! Can’t wait for the next challenge! Pinned! How fun! My girls have been wanting a doll bunk bed. 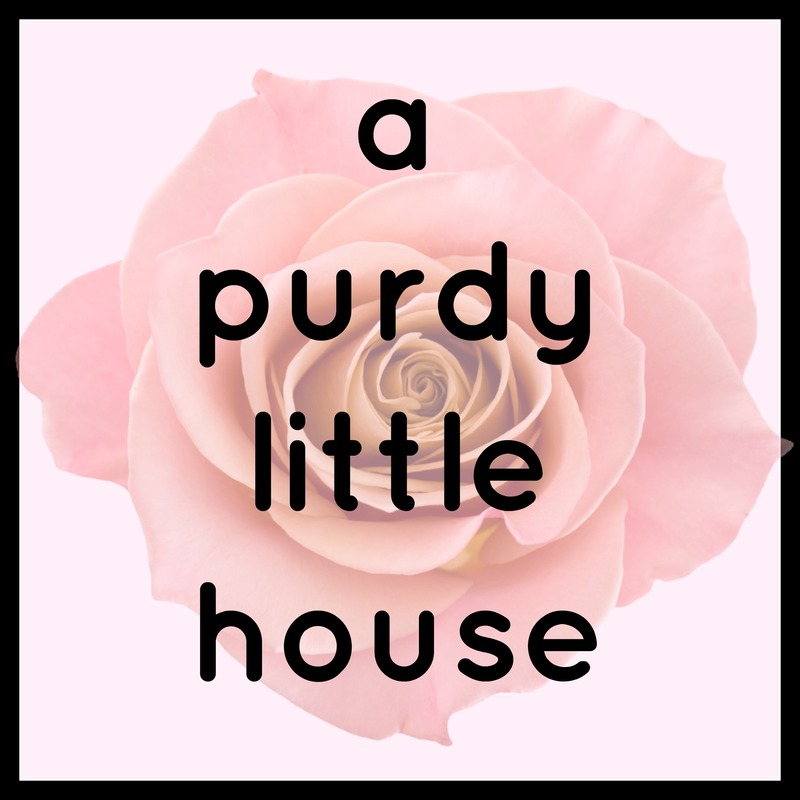 I love the versatility of this project…pets or dolls. I also like the fabric you used. How handy to have the perfect cushions just waiting to be used!! Thank you so much Michele 😉 I love anything that’s versatile and multi-functional, so it fit the bill for sure. Looking forward to next month’s challenge to see what everyone comes up with. Yay!!! !